Ends...Hand brushing, wipes, sprays, gels, paste and jumpy animals. Goodbye...Plaque, tartar, bad breath and stained teeth. Hello...Pet's healthy teeth and sweet breath. For use by dogs and cats 12 weeks and older. To support dental health & control plaque, tartar and bad breath. 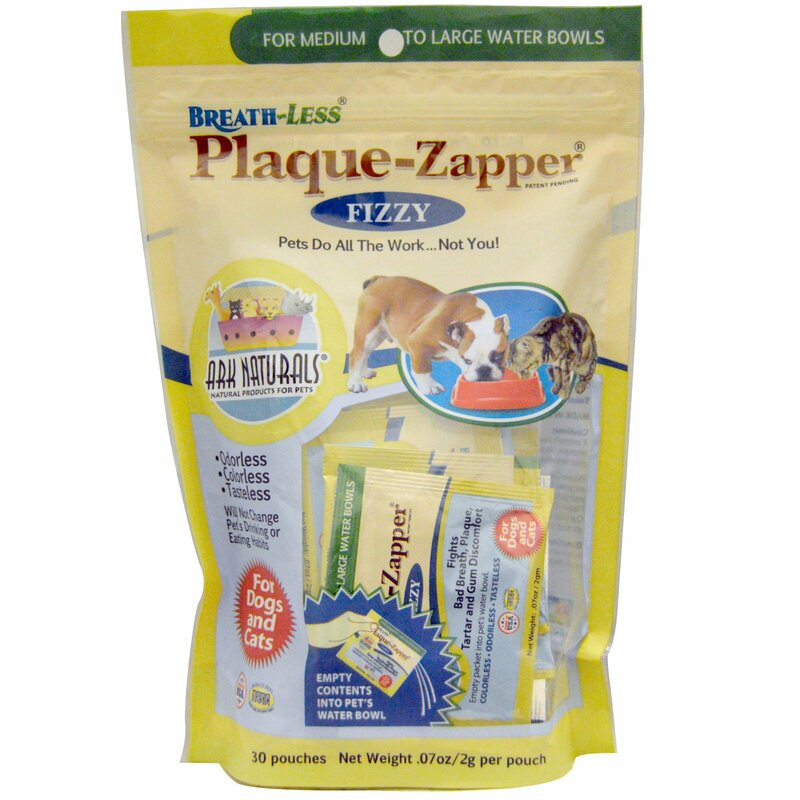 Plaque-Zapper contains naturally available enzymes that are activated by mouth saliva. As your pets drink from their water bowl. Ark's Plaque-Zapper "zaps" harmful mouth bacteria. Our clinically tested enzymes stop plaque from sticking to pets' teeth. 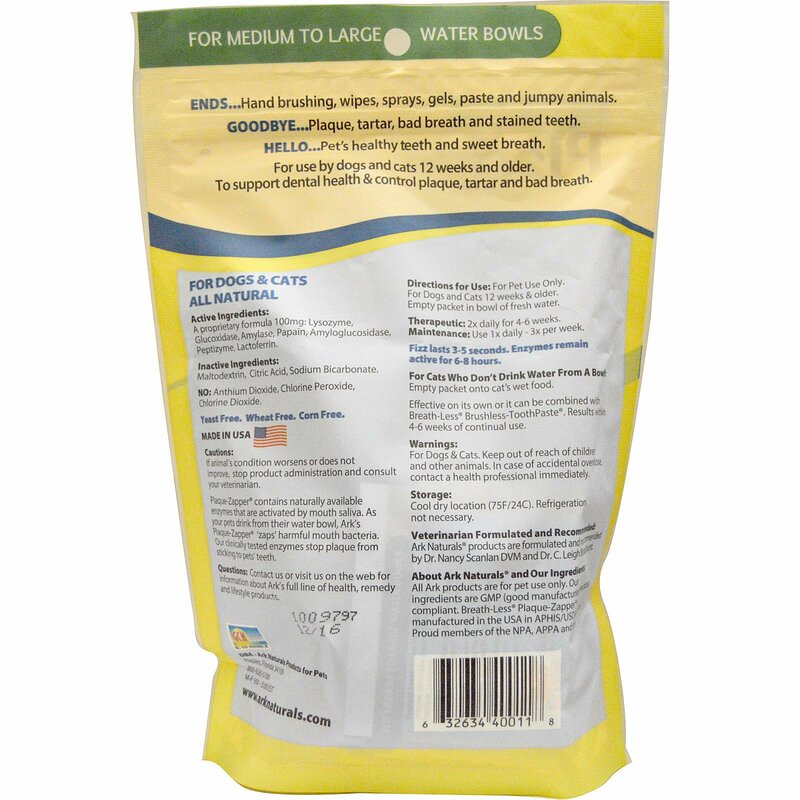 For Dogs and Cats 12 weeks or older. Empty packet in bowl of fresh water. Therapeutic: 2x daily for 4-6 weeks. Maintenance: Use 1x daily - 3x per week. Fizz lasts 3 - 5 seconds. Enzymes remain active for 6 - 8 hours. Empty packet onto cat's wet food. Effective on its own or it can be combined with Breath-Less Brushless-ToothPaste. Results within 4-6 weeks of continual use. Active Ingredients: A proprietary formula 100 mg: lysozyme, glucoxidase, amylase, papain, amyloglucosidase, peptizyme, lactoferrin. Inactive Ingredients: Maltodextrin, citric acid, sodium bicarbonate. No: Anthium Dioxide, Chlorine Peroxide, Chlorine Dioxide. Our ingredients are GMP (good manufacturing practices) compliant. For Dogs & Cats. Keep out of reach of children and other animals. In case of accidental overdose, contact a health professional immediately. Caution: If animal's condition worsens or does not improve, stop product administration and consult your Veterinarian. Storage: Cool dry location (75F/24C). Refrigeration not necessary. All Ark products are for pet use only.